Waterbridge opened its gates in September of 2010. With its outstanding world-class amenities, this community has quickly become one of the most coveted neighborhoods in Carolina Forest. Waterbridge is a gated community of unique, custom homes with a resort-style feel. The property was developed with a focus on panoramic waterfront living. The family-friendly neighborhood features lantern-lit streets and sidewalks, open parks, and underground utilities. Approximately 1/3 of the Waterbridge community is federally protected woodlands. The 120 acres of federally protected woodlands will never be developed and gives the neighborhood an added feeling of privacy. The 60 acre Palmetto Lake has private boat storage and a private boat launch where homeowners launch their canoes, kayaks, row boats, and paddle boards. There’s no better way to enjoy the water than right inside your own community. Caviness and Cates Homebuilders is building luxury, custom Low Country style homes in Waterbridge. 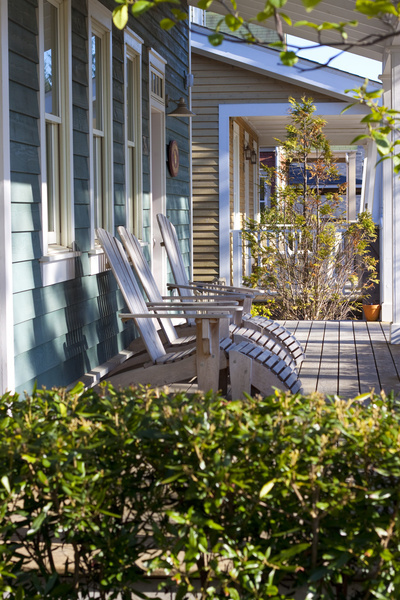 The coastal cottage style residences all have large wrap-around porches and panoramic lake views. Caviness and Cates offers tremendous value with its exclusive 1-2-10 Home Warranty and homes that are tested and certified as Energy Plus Homes. The company was founded in 1999 and has grown from building a few homes pera year to being listed as one of the nation’s “Top 100” Builders. Their entire team is committed to providing outstanding customer service and creating value in a high quality product. These new homes come in 6 floorplans, ranging from about 2000 to almost 3000 sq ft. The homes are three and four bedrooms, and priced from the mid $300,000’s to the low $400,000’s. Existing custom-built homes can re-sell for nearly $800,000. Amenities include a beautiful clubhouse, perfect for gatherings and fully equipped with everything needed to make any event a success. The resort-style swimming pool complex is the largest in South Carolina. The Waterbridge community has a fire pit, state of the art fitness center, swim-up pool bar, multiple parks, a beach volleyball court and two tennis courts. Combine the amenities with a 60 acre lake, boat storage and launch, plus access to the oceanfront Atlantica Resort, the Waterbridge amenity package is unmatched on the Grand Strand. The Waterbridge community at Carolina Forest with its 120 acres of federally protected woodlands is perfect for a feeling of privacy and isolation from the city, yet it’s only a short drive from all of the world class entertainment, fine dining and shopping, championship golf courses, the Intracoastal Waterway, and the Grand Strand’s 60 miles of white sand beaches that made Myrtle Beach famous. And Carolina Forest itself has become the definition of well executed residential master-planned communities in Myrtle Beach. It has its own banks, doctors and dentists, award-winning schools, and no city taxes in most of it. The Trembly Group Real Estate Professionals are always happy to show their clients around one of the best subdivisions in Carolina Forest. Call for a tour and to see the available homes in Waterbridge.